Detective Caleb Maxwell shoved the metal wastebasket away from the teacher's desk. There it was! The missing book. He bent down and picked it up. With a flourish he handed the paperback to his fifth grade teacher. She smiled at him. "Thanks, Caleb. What made you think to look there?" "Don't know." Caleb shrugged his shoulders. But inside Caleb was thinking, it's because I'm Detective Maxwell, of course. I use my brain. I use my eyes. My brain told me since Hayley said she'd put the book on your desk, it had to be close by. My eyes saw the small space behind the can where the book could be. And the book was there. Detective Maxwell solves another mystery! The Great Solver of Cases marched out of the classroom and headed for his grandmother's house. He was still smiling when he pushed open the kitchen door. What's that funny smell? Caleb's smile disappeared like chalk being wiped off a blackboard. Before he could decide what the odor was, he looked through the kitchen into the living room. Oh, no! Gramma's doing something weird again! He could see his grandmother in the living room scrubbing at the carpet. The scrubbing wasn't weird. The weird part was that she was lying down with her face practically in the carpet. This is weirder than her calling the cats by the wrong names, Caleb thought. Neither black cat had seemed to mind, but Caleb did. Time for Detective Maxwell, the Great Solver of Cases, Caleb thought. I bet I can crack why Gramma's being weird. Use my brain. Use my eyes. Pay attention to details. Caleb released the back door. It swung shut with a bang that made his grandmother jump. "Caleb," she said, "How many times do I have to tell you not to bang that door?" "Sorry, Gramma." Caleb dropped his backpack onto a kitchen chair. His grandmother sat up. "I left you cheese and soda crackers on the table there. You eat them before we get to the chores." "Yes, Gramma." Caleb sat down and reached for a cracker and a slice of cheese. This plate's dirty! Looks like egg got cooked on in the dishwasher. Now why would she give me a dirty plate? You couldn't do any damage to an enemy with a dirty plate. And besides, Gramma's not my enemy! Caleb brushed off the bottom of the cracker and blew on the cheese before taking a bite. Out of the corner of his eye, he saw Gramma stand up with the rag in her hand. "What'd you spill, Gramma?" "Paint. I was repainting the molding around this doorway. So if you need to go into the living room, go around and use the front door. The paint's still wet." "I will." Caleb looked at the dark gray door jamb. It did look shiny and clean against the lighter gray of the walls. Too bad Gramma didn't let me paint--that would've been fun. I suppose that means I'll be stuck weeding the garden. Use your Eyes, Detective Maxwell. See what you can see. Caleb looked at his grandmother. Uh oh. "Gramma, you've got paint on the end of your nose." "Drat." She rubbed at her nose with the rag. "Did I get it?" "Yes." Now why would she have a round spot of paint on her nose? Time for brain work. If it was on her hands, she might have rubbed her nose . . . Caleb checked his grandmother's hands; both looked clean. And wouldn't rubbing paint off her hands onto her nose have made a smeary blotch? Notice every detail, Caleb told himself. He glanced up at the door and saw an unpainted section near the top of the door frame. Should I tell her she didn't get that place? No, she's taking one last look herself. She'll see it. But Gramma didn't see the unpainted spot. Instead she turned away from the doorway and asked Caleb a question. "How was school today?" "Did you bring me any more of those pictures you draw?" "No." Caleb glanced at the F-16 fighter plane that Gramma had hung upside down on her fridge. That was another weird thing. Use your eyes. Use your brain! Caleb told himself. "I haven't had time for drawing lately." "Too much homework, I suppose." Gramma stepped to the sink to rinse out her rag and drop the paintbrush into a container of water. "I guess." Caleb shrugged his shoulders. "I won't have homework tomorrow though." "I'll show you." Caleb reached into his backpack and pulled out a sheet of paper. He handed it to his grandmother, who dried her hands before taking it. Caleb watched her closely. She held the paper first in front of one eye, then in front of the other, then back again. Hey, it's like she can't see, Caleb thought. Yeah, that's it! I've cracked this case! She couldn't see the difference between the cats and she couldn't see which way was up on the airplane and the paint on her nose . . . I bet she put it too close to the molding when she was painting. Caleb's grin of success faded. But . . . this detective business is not so great. Not when you find out bad things. "Gramma, you aren't going blind, are you?" "Of course not!" Gramma slapped the paper down onto the table. "Why do you think that?" "Well, you just seem to be having trouble seeing." "Yeah, you were holding my permission slip for the field trip really close to your eyes." "Field trip, eh? So that's what that paper was about." Gramma snorted. "That light purple print is always so hard to read." "No." Caleb turned the paper right side up. "It's nice and dark black." "Well, we'd better get at them chores." "Wait, Gramma." I can't just let this go, thought Caleb. A detective wouldn't stop until the problem was solved. And, something's got to be done about Gramma's eyes. "Gramma, maybe you need glasses. You've got my F-16 picture upside down on the fridge." "Yeah. Here." Caleb reached over and turned it right side up. "You know, at school they have us get our eyes checked every year. Do you ever get your eyes checked, Gramma?" "Of course. Why I had them checked . . ." Gramma rubbed her hand back and forth across her nose. "Well, now, let's see. Hmm . . . It was when . . . no . . . I think . . ." She suddenly grinned. "I guess it has been a while." She reached out and patted him on the arm. "So, Caleb, you think my eyes are pretty bad, do you?" "Yes, Gramma. So you'll get them checked?" "Yep. You made your point." "Yes!" Caleb's raised his fist in victory. 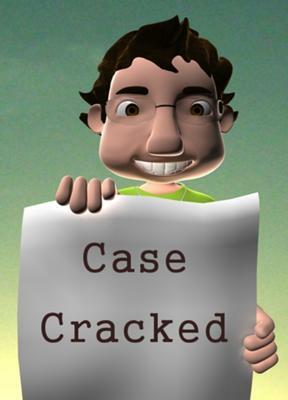 Detective Maxwell, the Great Solver of Cases cracks a case again! Loved the story, the young character, his concern for his Gramma, how he recognizes his observation skills and finally solves the "case." This story should make young readers aware of their own skills - give them more confidence in interpreting their world. How fun! Caleb is quite clever. I really enjoyed how he pieced things together to come up with the solution. My favorite part was about the cats. A great detail that was merely funny to start with and became more significant as the story went on. A well written story with an enjoyable main character who has a positive self image. Caleb believes in his ability of observation, and shows the reader that he can solve mysteries. Children will delight in hearing the adventures of Detective Maxwell. He is a mini Poirot. I liked how you built up the evidence. At first I thought she might be, you know, going senile. But then the evidence built up and the final nail in the coffin was the grandmother not seeing the place she missed painting. And the stakes are kind of high--something is wrong with his grandmother. So, much more interesting than the usual mysteries for this age group. Well done! I like how the "hero" uses observation and logic to solve problems.